A great pair of solid teak cabinets with sliding doors and adjustable shelves inside. Finger- jointed case on round legs. Designed by Hvidt and Mølgaard for Søborg Møbler in 1958. Made in Denmark. Very good original condition. Teak has beautiful graining. An interesting Japanese miniature cabinet, circa 1920s. Original brass hardware. 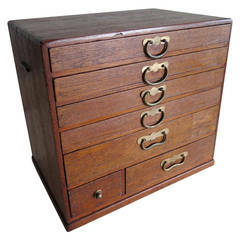 Chest could be used for jewelry, watches, etc. 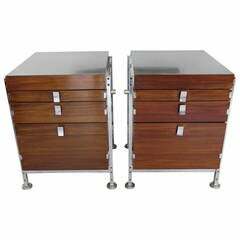 Measures approximate 10.25" D, 15" W, 13.75" H.
A pair of rosewood and chrome-plated steel cabinets by Jules Wabbes, Belgium, circa 1960s. Knoll, Florence Knoll, Knoll Associates Inc. Pair of tambour chests by Peter Hvidt & Orla Mølgaard Nielsen. Chests feature three interior adjustable shelves. Pair of solid teak cabinets with tambour doors. Finger- jointed case on round legs. Designed by Hvidt and Mølgaard for Søborg Møbler in 1958. Made in Denmark. Great original condition. 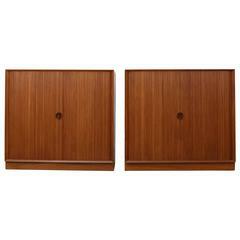 Pair of solid teak cabinets. Finger- jointed case on round legs. Designed by Hvidt and Mølgaard for Søborg Møbler in 1958. Made in Denmark. Great original condition. 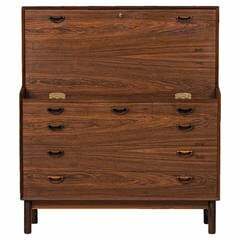 Rare cabinet or secretaire in rosewood with brass details designed by Peter Hvidt & Orla Mølgaard Nielsen. Produced by Søholm Møbler in Denmark. High quality design and construction two-door cabinet by Peter Hvidt & Orla Mølgaard. Oiled teak wood with brass hinges and fitted interior. A solid teak cabinet designed by Peter Hvidt and Orla Mølgaard-Nielsen for Søborg Møbler in 1958.